Summer is coming, along with the many festivals, open air events and general being outsideness that comes with the warm weather that is supposed to accompany this season. Whether you’re going to Glastonbury, Creamfields or something else, we hope you have an awesome weekend. But it’s equally important to stay safe as well as having fun. 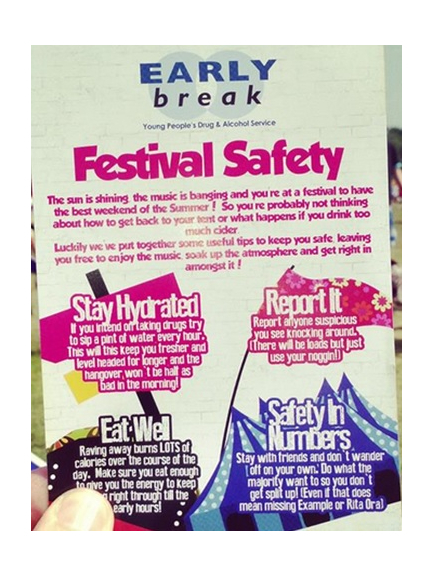 Early Break UK have put together some tips to ensure you can enjoy the music and make sure your personal safety is never compromised. 1) Drink lots of water. If you’re drinking alcohol then you should ideally sip 1 pint of water every 60 minutes. It will keep you feeling brighter and more alert for longer. Trust us when we say you’ll feel a lot fresher in the morning. 2) If you see what you perceive as any suspicious behaviour going on, report it. Chances are there’ll be plenty of dodgy looking people around, so use your inititive. 3) Never travel on your own, always travel in a group. Stay with friends and don’t wander off to watch a different artist by yourself. For once, be a sheep and follow the group majority. 4) Eat well as well as drinking sensibly. When you’re dancing away you’ll burn lots of calories over the course of a weekend festival, so eat enough to keep your energy levels up. You don’t get much sleep at these things after all.